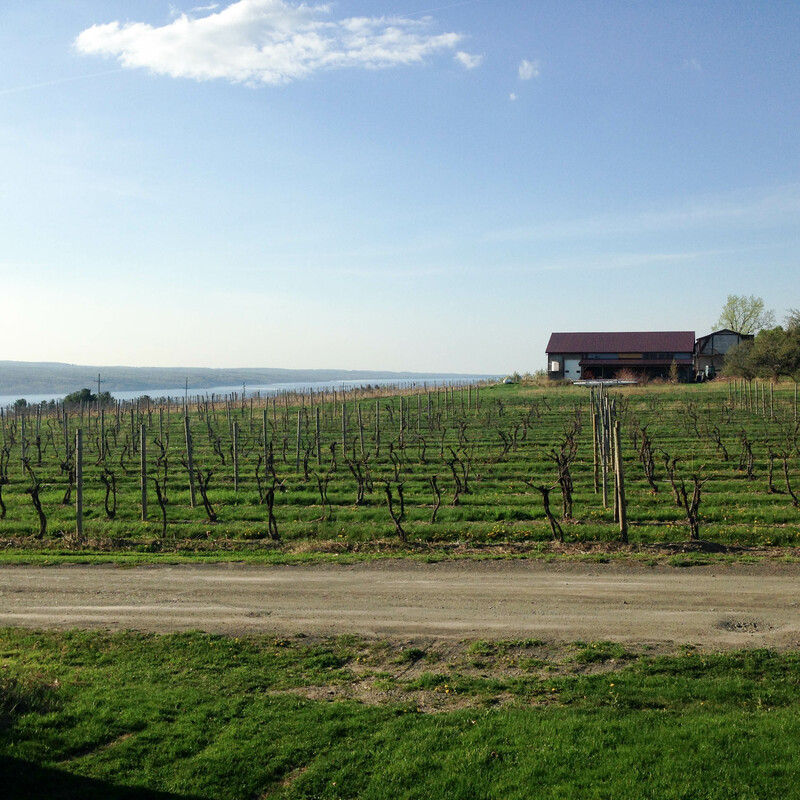 One of the reasons we love the Finger Lakes region of New York is the sense of community. Everyone we come across at the wineries, in the restaurants, along the hiking trails or in one of the many quaint towns along the lakes is friendly, helpful and welcoming. They are always excited to share the stories behind the wine, their wineries, the fresh local fare and creative recipes as well as the many places to visit and things to do; but they’re also just open to simply making friends and sharing experiences. This has been the case both when we traveled with and without the kids and it’s what makes this an area to treasure (and an area we hope to call home someday). Do you ever think about where you plan to live next? Or perhaps you’ve already found your home. Well, for Mike and I our plan is to relocate as soon as these munchkins are grown (but you never know how or when new doors might open). There are just too many things to do and see in this world and we want to explore. 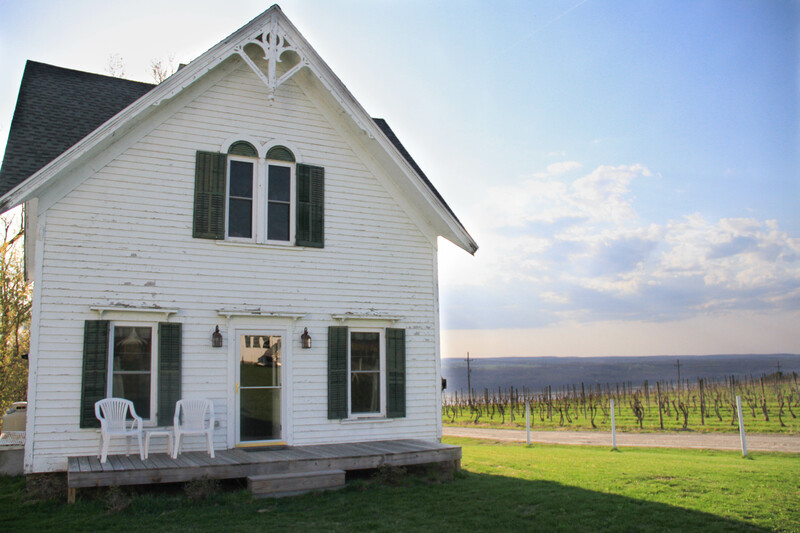 After our first trip through the Finger Lakes, it fast became a top contender for our next home – and much to our surprise as this was an area we had never really heard of and stopped through on a whim! So we went back this time trying to be skeptical – playing the devil’s advocate so to speak. You know, perhaps we had just been seeing things through those rose-colored vacation glasses and it wasn’t really everything we remembered. Then we met Tina, our airbnb host for this beautiful little house on their family’s sixth generation farm and vineyard. Tina greeted us like we were long-time friends. We stayed in the old fruit packing house which had been lovingly converted into a beautiful private residence for her mother-in-law to live in when she returns for the summers from Florida. When she’s in Florida the house is rented as a little getaway for two. Her mother-in-law is a painter and many of her works adorn the walls, and the home is filled with natural light and inspirational views out every window. We’ve used airbnb (and similar vacation rental sites) numerous times, and this is easily our favorite of the bunch. 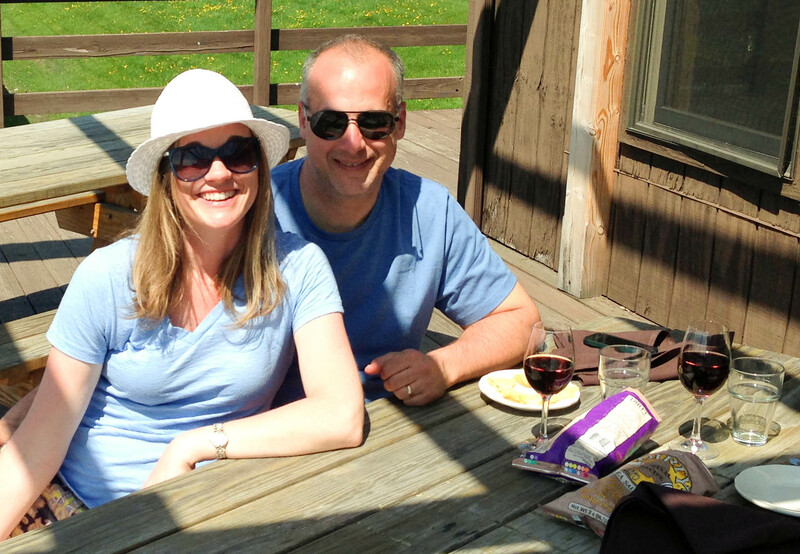 While Mike and I spent the majority of our time touring the area, visiting wineries and hitting many of the area’s delicious restaurants, we also spent time with Tina and her husband Eric, which led to one of our most idyllic vacation moments. As we drank local wine, shared stories and listened to a local band with Tina, Eric and their good friend Laury (at one of our favorite restaurants which we’ll post about soon), Mike and I expressed our love for the area and for learning about wine and wine production. The next thing we knew Tina invited us to help down at the vineyards. It was time to tie the vines. So, the next morning we met Tina at the farm and she gave us a brief lesson on how to carefully, but securely tie the vines. We spent the next four hours on the side of the hill, with Lake Seneca behind us, vines all around us and the sun on our faces. So much for playing devil’s advocate! The Finger Lakes, once again, called us home. 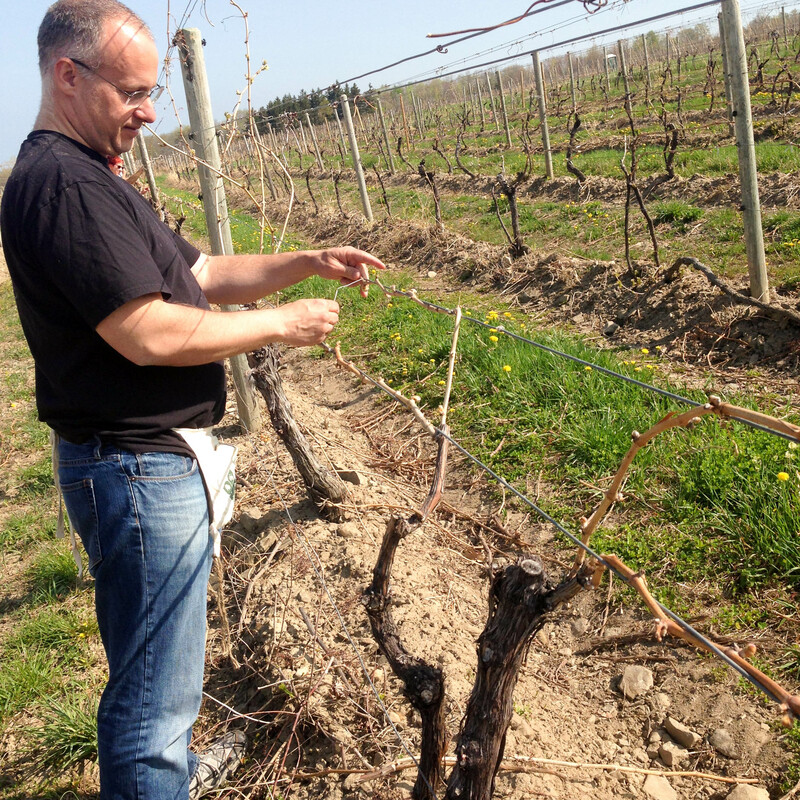 We learned a few things that morning as we tied the vines of one of our favorite varietals, Cabernet Franc. (Hopefully my black-thumb won’t ruin the 2015 production!) 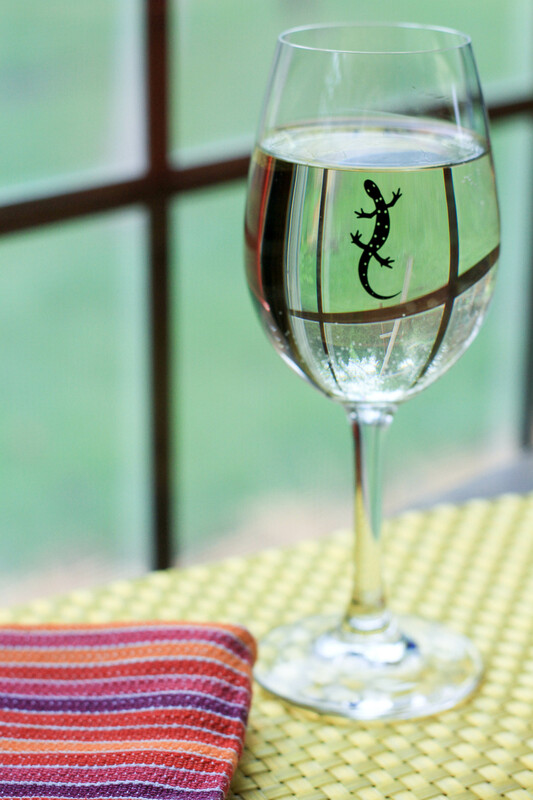 Wine production is an incredibly hands-on and intricate process. It’s labor intensive. It’s detail-oriented. It’s time consuming and it requires a great deal of knowledge. But it’s also peaceful and meditative, challenging and interesting, consistently unique and something that allows for creativity and inventiveness. In fact it’s not unlike cooking to us in that regard. It’s absolutely something we love. We could have stayed out there for days! Alas, we were running short on our time and wanted to squeeze in a few more wineries and restaurants. So after our zen-like morning, we dusted off and stopped in at Red Newt Cellars & Bistro just up the road. Our motivation for stopping in was three-fold – 1) We wanted to see if they had any little stuffed Red Newt animals to bring home to Miss A (we were tasked with finding her as many winery mascot stuffed animals as possible), 2) We heard they provided a delicious, fresh lunch and had a beautiful deck on which to enjoy it, and 3) They sell Verjooz. 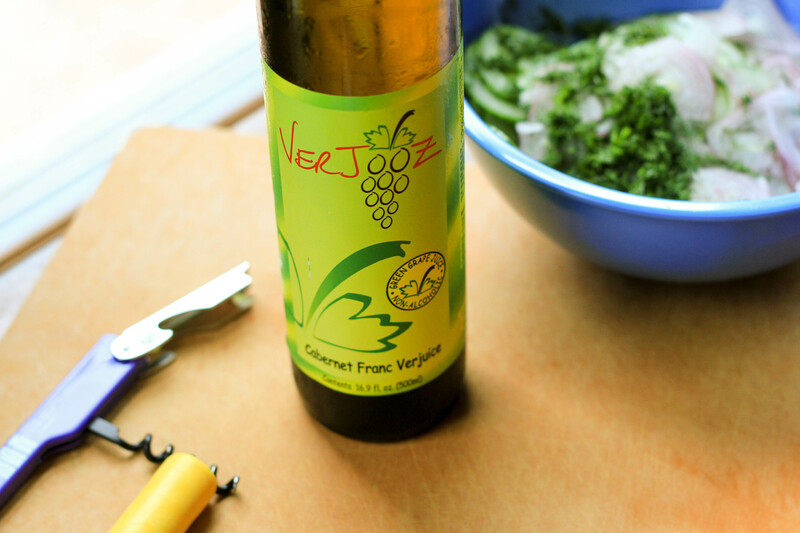 Verjooz, or verjuice, was created by our very own hosts – Tina and Eric and the Finger Lakes Food Company, and from the very same grapes we had just been tying! It’s a green juice, harvested from Cab Franc grapes at a Brix measurement of about 10-12. In layman’s terms, that means the grapes are young and still primarily sour. Most table wines are produced from grapes harvested with a Brix measurement between 21 and 25. Verjooz is not something you’d want to drink, but rather use to enhance recipes. It brings freshness to recipes and enhances the flavors of the dish, similar to using a splash of citrus (That’s why they refer to it as the “lime of the vine.”). The two recipes that follow, are hardly recipes. They are simple dishes, easily prepared and they hardly need instruction. That said, they are flavorful, delicious and ideal for summer lunch on the deck, in the sun, while enjoying a glass of wine (red or white pairs nicely). They are also perfect for using Verjooz! The first is a grilled cheese sandwich inspired by our lunch at Red Newt (which incidentally was another place we enjoyed meaningful conversations with the tasting room hosts and guests). 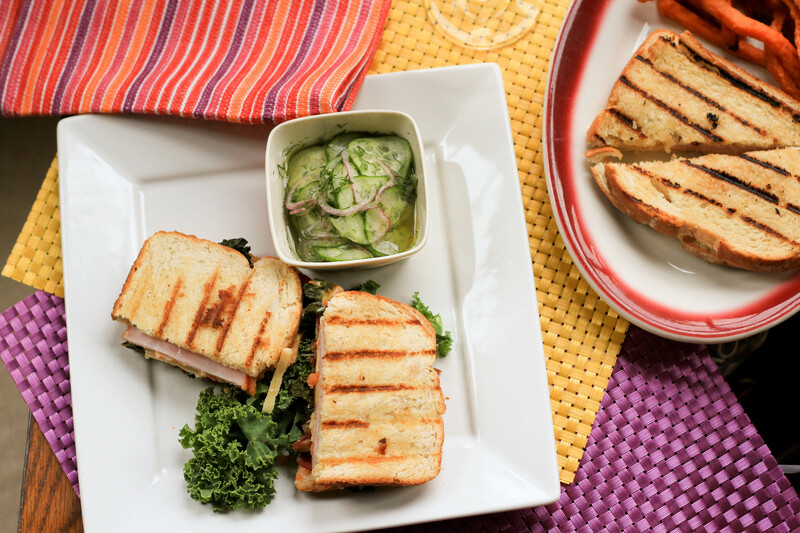 It’s served on house-made anadama bread with New York state sharp cheddar. Additional ingredients are available including bacon, kale and, when in season, tomatoes. 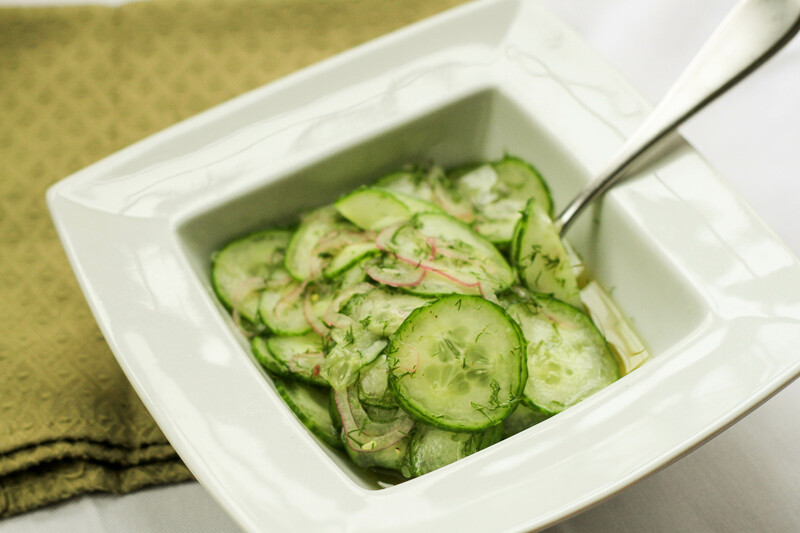 We’re also sharing a recipe for a side dish (which I have been eating as a light lunch as well), a cucumber-dill salad. The salad is easily assembled in about 10 minutes. 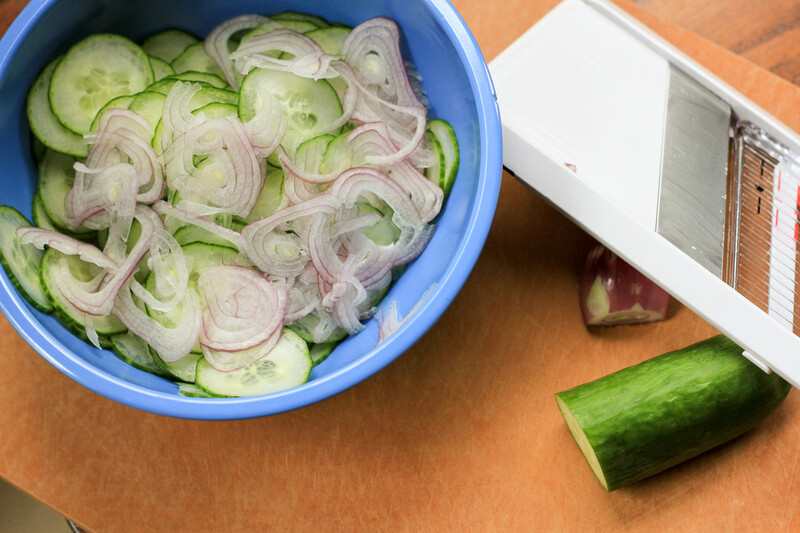 Using a mandoline, we sliced an English cucumber and a shallot. Then we chopped up about 1/8 cup of fresh dill. 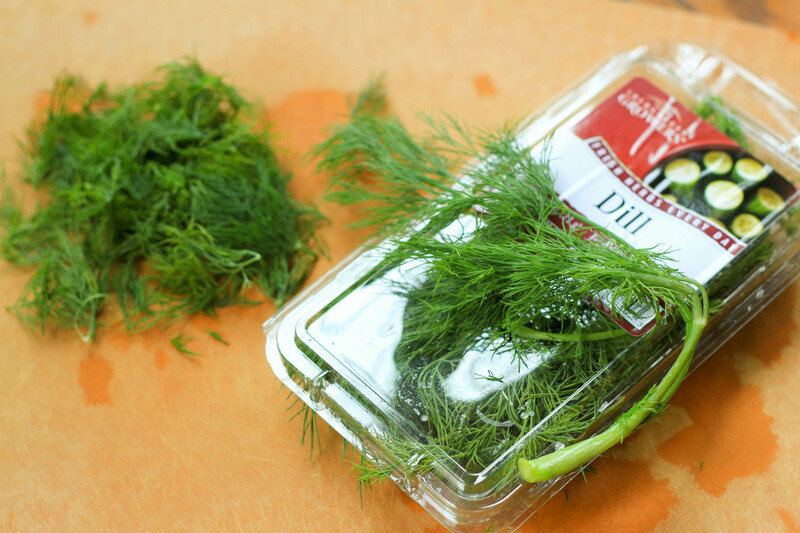 I never used to enjoy dill, but lately I find myself absolutely craving it – on fish, in salads, even on French toast! Interesting how our tastes change over time. We then tossed the veggies with white wine vinegar, Verjooz, honey and salt and pepper. The result is a sweet and sour salad that makes for a great light lunch with some French bread, or a side dish to a picnic meal. Mike and the kids typically don’t enjoy cucumber, but since we were doing a little “cooking around the world” stateside, they were willing to indulge me. (The kids were actually really excited to be cooking for the blog again. They both even stopped playing to help in the kitchen the entire time!) I gave the salad 4 spoons (it’s a winning combo of flavor, simplicity and ease), Mike and Mr. N gave it 3 spoons and Miss A, 2 spoons. 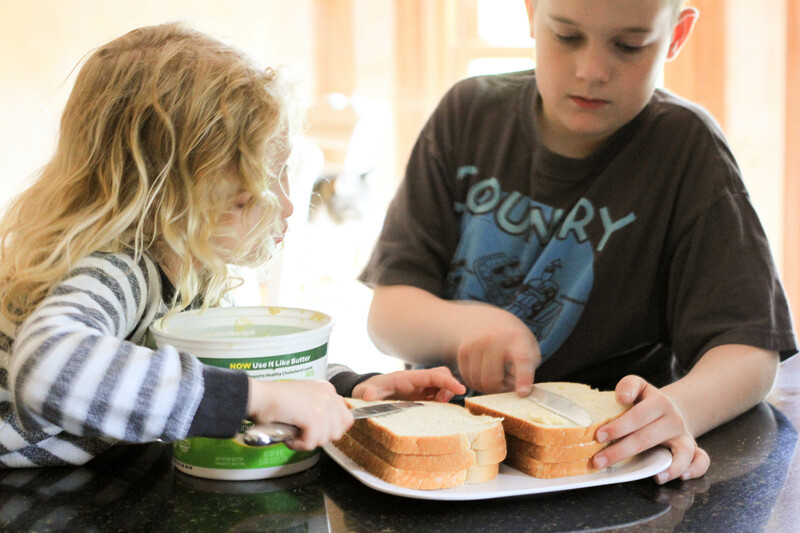 For the grilled cheese, the kids buttered the bread and massaged the kale (it really does work!). We also toasted the buttered side of the bread on a griddle until golden brown. 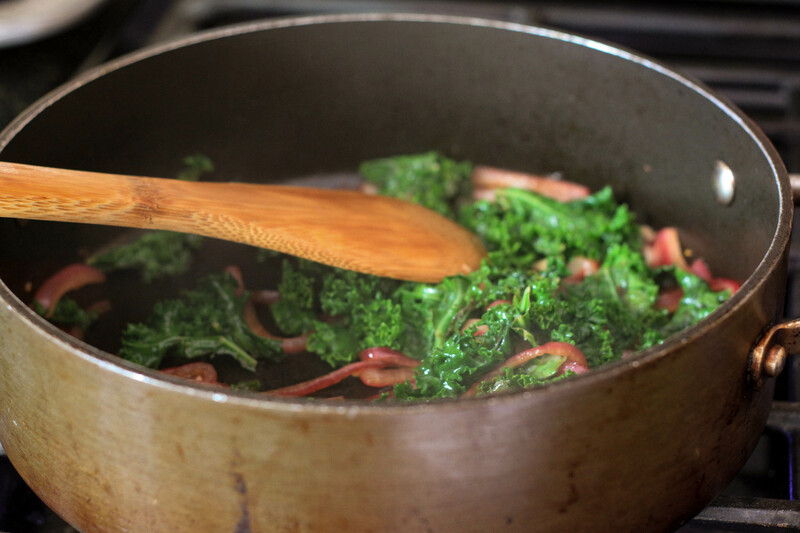 We then sauteed the kale with shallots, garlic, a splash of red wine vinegar and Verjooz. Next we assembled our sandwiches. I chose kale, tomato (heirloom – frozen from last summer) and bacon. The kids opted for only bacon, no surprise there. While I’d prefer they tried the kale, in the spirit of Red Newt, sandwiches are made to order! Once assembled, we baked the sandwiches at 300F until the cheese was good and melty. I should note here, we didn’t use homemade bread or NY state cheddar, but if you have it on hand, go for it! If you don’t, any bread and sharp cheese combo will do. We used sourdough and Kerrygold Dubliner Cheese. It’s no surprise the sandwiches went over well. It’s hard to go wrong with a grilled cheese sandwich. A hint of sourness from the bread and Verjooz, a salty bite from the bacon and cheese, sweetness from the shallots and tomato, and a slight bitterness from the kale, not to mention the crunch of the toasted bread – it covers nearly the entire flavor profile wheel! Mr. N and Miss A both voted 4 spoons (Actually, Miss A was insisting it was 5 spoons – off our charts!). Mike and I gave them a solid 3 spoons. However, what was surprising is that Mr. N requested to try a bite of my sandwich, kale and all, and liked it! He even said he’d eat one that way next time. Nicely done Verjooz! 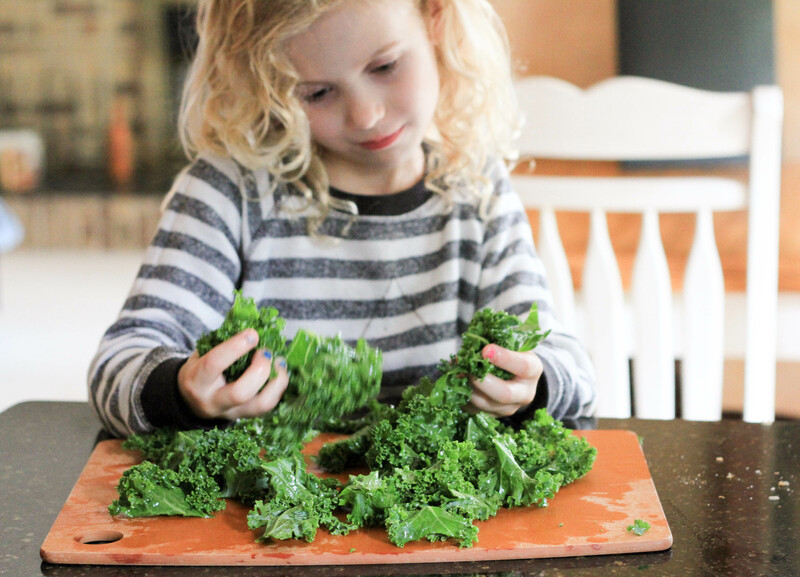 I think a new slogan might be in order – Verjooz, for making vegetables your kids will eat!! Side note: while we didn’t find a red newt for Miss A, she did make out like a bandit from this trip! Miss A’s winery friends posing for a “family picture.” Photography by Miss A. And a Red Newt (well, black in this case) still made it home. 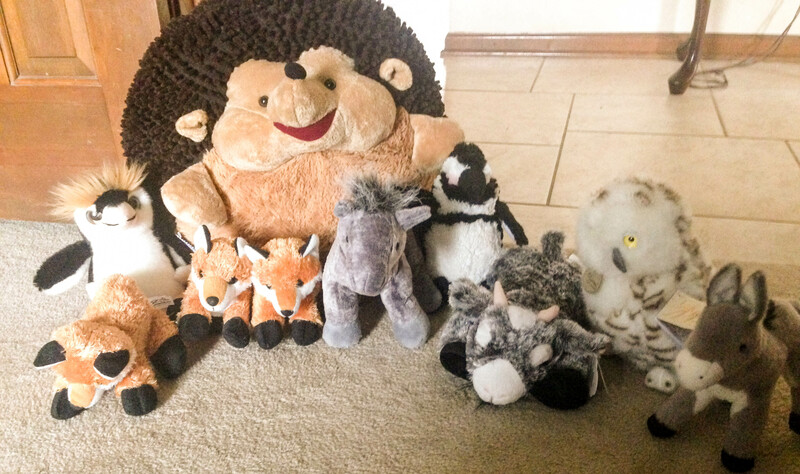 Miss A definitely made out with the stuffed animals but it sounds like the whole family made out from your Finger Lakes experience. Your sandwich and salad sound like a great souvenir. Great! I know the kids will have a terrific time going along with the two of you. Beautiful post Kristy and so much of it resonated with me… the idea that you never know how or when new doors will open; the time and care that goes in to making something worthwhile and the meditative practice of tying the vines… amazing the moments that end up creating our most lasting and cherished memories. And how about that converted fruit packing house… could it be any more adorable (if you happen to have any interior shots, I’d love to see them via email). It’s hard to beat the simplicity and taste of a good cucumber salad and I’m so happy to know the massaging is working for you 😉 it really does make a difference! ❤️ thank you for sharing your journey and love for the Finger Lakes regions with us – I certainly understand the attraction. It almost looks like a farmhouse in France. What a fun and relaxing time together. I understand the whole idea of Miss A’s concern over having green stuff on her sandwich… LOL However, I think it sounds amazing. I like the phrase a tree-change! And I’m definitely going to try a chicken gravy. Great idea! What a fabulous story Kristy, I’m quite intrigued about the Finger Lakes…sounds like a great road trip for us too! Your recipes look mouth watering, I absolutely adore kale and the cucumber salad sounds delicious too. The grilled cheese sounds like a winner as well. Love the sound of the NY state cheddar, yum. 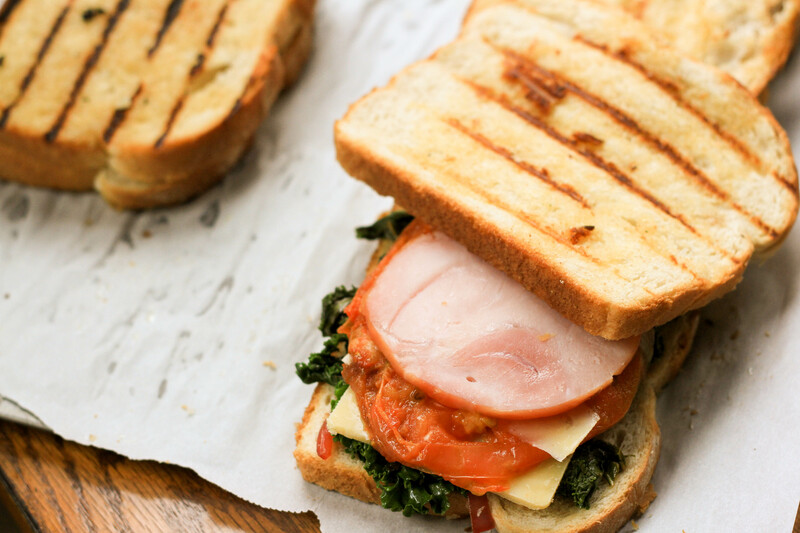 This is interesting, I never thought of using Kale in sandwich. Nice idea, in fact you gave me another idea, why not add kale chips in sandwich. Kale chips might be interesting for sure! Thanks Natasha! We sure love it. What a wonderful time you are having, I am positive the 2015 production from the Cabernet Franc you and Mike worked on will be one of the best. It’s funny because it’s not a place we ever expected to love, but we definitely do. I don’t blame you for not wanting to move. You have so many treasures of your own for sure! Sounds like a wonderful vacation! It certainly was Dawn. In our top five for sure! Thanks Sally! LOL – love Phil’s comment! We’re going to try our hand at grape tomatoes again this summer. We (I should say Miss A) had mild success with them last year. We never got any though as she ate them right off the vines!